Choose mesh or vinyl to fit your truck bed. 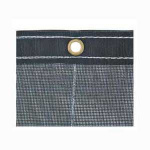 Durable 1,000 denier polyester mesh fabric, heavy duty seam construction and brass grommets. UV protection for long life. Solid vinyl tarp rated to 400° F for hot asphalt. Get the ultimate in coverage with your choice of a mesh or solid vinyl tarp to fit your dump bed. Both tarps are constructed of durable 1,000 denier polyester and have a UV-resistant PVC coating. 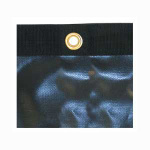 They feature brass grommets and heavy duty double-stitched and reinforced hems. The solid vinyl tarp is rated up to 400°F for covering asphalt. Choose from a wide range of sizes. Please contact Customer Service for further information.